What sort of a thing is society which the social scientist so avidly studies? Is it something completely independent of the way human beings think about it and conceive it to be? Or is it affected in its very being by the way men think about it and conceive it to be? Has it, so to say, an essence of its own which men have only to find and discover? Or is it something like what the existentialists say about man; that is, something that has no essence of its own, but something which is made and created out of the infinite choices of diverse men? What we confront as society is, on this view, not something given by nature but rather that which was created by men in the past and that which is being made and remade by men in the present. It is like the habits of a man’s own character, created by choices made in the past, but now confronting him and others as something ‘given’, something to be taken as ‘datum’, something to be worked with or worked against, but in any case inevitably to be taken into account. 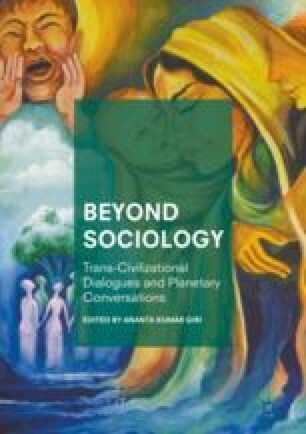 In this context, the chapter discusses two approaches to society, socio-centric and Atman-centric, and helps us go beyond the contemporary logic of a priori sociological determinism.